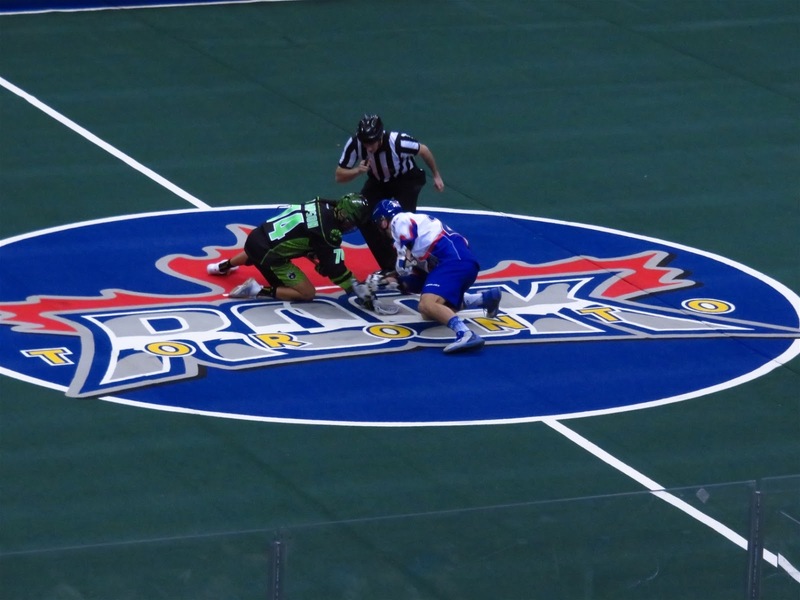 Tonight the Toronto Rock played host to the Saskatchewan Rush at the ACC. 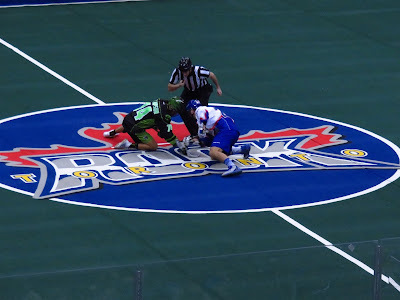 This was the Rush's first game of the season while the Rock lost their first game last week to the Buffalo Bandits. Once again Teena and I have season tickets and were there tonight. I've always love the atmosphere of the home opener. There's just so much anticipation and hope for the season ahead. As always, Scotty Newlands sang the national anthem. Our friend, Trish, surprised us by buying a ticket beside us and showed up unannounced. Nick Rose (Rosey!) was in goal. He didn't have the best of nights but then was not well-protected by the Rock's defence either. He was pulled after the 9th goal was scored on him in the second period. Instead of piped in music, the Rock had a DJ. I miss the other tunes, especially Cotton Eyed Joe. It was good to see the red headed guys back. Toronto went down 2-0 very quickly but battled back to tie it up 2-2 here. After that, it was all downhill. Like I said, it was all downhill. The Toronto Rock Cheerleaders in their Christmas outfits. Iggy Rock worked the fans. Half way through the 4th quarter, Toronto's Billy Hostrawser and Saskatchewan's Mike Messenger went at it. This was the punch the bloodied Messenger's face. So in the end, Toronto lost 17-9. They were outplayed and outclassed. They lost the game but won the fight. Hopefully that will give them the spark they need for the coming games. The next home game is at 7pm on December 30 against the Buffalo Bandits. Teena and I will be there.